hello, brain explosion. It was bound to happen, with all the people and learning. And dare I say inspiration. I'm going slow this week, in the hopes of capturing the ideas, not letting them flit away into oblivion. hello, baking. The never-ending story of my kitchen at the moment is that the kids keep eating all the food! I didn't bake as much as I planned to last week, but I did leave packet mixes behind so they could fend for themselves. They didn't, so now I'm playing catch up. hello, newsletter. 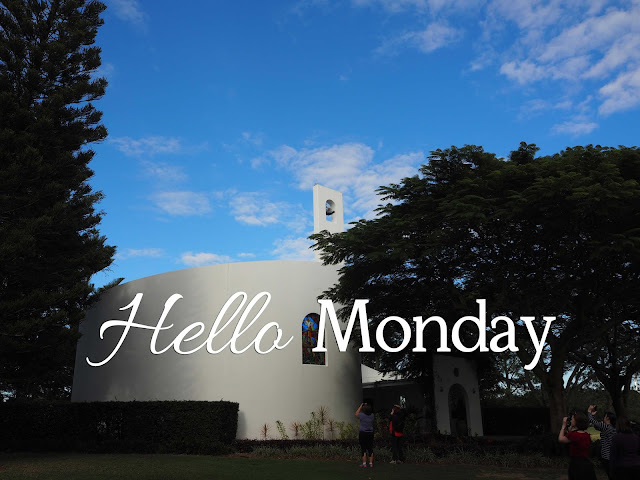 I've had this little idea for a while now, to start a newsletter that says hello to Monday every week. I waffled and wondered and pondered, and this morning I bit the bullet and started. You can sign up here, for a September 7th launch. It was a wonderful weekend wasn't it? I really feel that I have my one thing nailed down....I'm excited. ProBlogger sounds as though it was amazing!!! Problogger would have been amazing. I loved everything that was shared on IG. Inspiring. Looking forward to hearing more about the ProBlogger event. I've been pondering some ideas for my blog, etc, lately & watched a webinar yesterday about blogging. I'm waving back from Texas as I clean house, do a little paperwork, and set up for an Intro to Bible Journaling class I'm hosting here tomorrow for my young lady friends who'll be heading back to college at the end of the week. Have a great week! Why is it that when you go away there is always so much to do when you return. Problogger would have been inspirational and mind blowing. I could do with some of that. Maybe I should bake something ... just an idea. Go you with your newsletter - going to sign up now! BTW I loved meeting you over the weekend - lovely to now be able to put a face and a voice to your blog!!!! Sounds like a great ProBlogger weekend. I was living vicariously through you all. Have a good week! Hello! It was great having our sneaky little chats! In typical fashion, I haven't yet done the things from problogger that I told myself I'd do as soon as I got home!!! Good on you for starting your newsletter.